Americans were taught about Paul Revere’s ride in school. 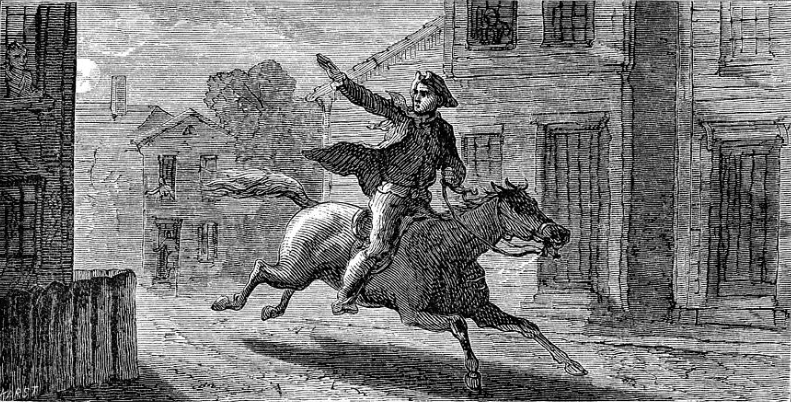 He was said to have ridden from his home in the North End of Boston, to Lexington and Concord, to warn the people there that Federal troops had landed in Boston Harbour and would soon reach the townships. Of course, the story was tarted up a bit for the history books. First, it’s unlikely that he shouted, “The British are coming,” since, at the time of the ride, in 1775, he was in fact British - a British colonial - and would have regarded himself as British, as would the townspeople. So, what did he shout on his ride… or did he in fact shout anything? It’s more likely that he simply went to the back doors of select sympathisers and asked them to spread the word that the Federal troops were on the way. But, of course, that would have made for a far less colourful story. It is likely, though, that the ride itself did actually take place and that he did succeed in rousing the townspeople. Amongst them were the minutemen, who later did quite a good job of picking off the Federal troops. At that time, this practice was looked upon by armies as cowardly. It was considered honourable for columns of troops to march toward each other and fire. Those with the most troops to sacrifice usually won. The colonists could not have prevailed, had they followed this method of battle. But the colonists’ cause was a laudable one, even if they were far outnumbered and not as well-trained or well-armed as the Federals. Under the circumstances, they succeeded because they swallowed their pride, used their wits and, fighting guerilla style, prevailed against a greater opponent. Since that time, the US has moved away from being a republic and has become more of a federalist state. This progression continued fairly steadily until 1913, at which time two major changes occurred. The banking interests in the US had become powerful enough to push through two bills that would serve to enrich them for generations. The source of that wealth would be the American taxpayer. First, income tax (which had been attempted previously, but never gained full acceptance) was introduced. Second, to add insult to injury, the Federal Reserve was created. It was neither a federal body, nor was it a reserve. However, in addition to having the power to create all currency for the US, it had the power to set interest rates. Through this control, it was possible to create steady annual inflation (defined as an increase in the currency in circulation). This had the effect of diminishing the purchasing power of the dollar by slow measures, effectively robbing the population incrementally through inflation. The Fed’s power made it possible to create large amounts of money out of thin air, to be loaned by banks. With this easy money, investors could borrow heavily and buy into the stock market a level previously regarded as impossible. This cornucopia was so forthcoming that, by 1929, a level of debt was reached that was unsustainable. If even a small increase in the interest rate was advanced, a stock market crash would occur, as debtors, who were up to their teeth in debt, would be underwater overnight. What’s interesting here is that the very body that had taken over the economy in 1913 - the Federal Reserve - had created the artificially low interest rates, supplied the money, created the bubble, then, by raising interest rates in 1929, provided the pin to prick the bubble. This, they will most assuredly do. The debt has already been created. A crash can be triggered in many ways, including the tried-and-true method of raising interest rates. And, after the predictable crash, the public will most assuredly cry out for those in power to “do something.” The warning signs have been in view for some time that that “something” will be digital currency – a currency that will make it necessary for virtually all economic transactions to pass through the hands of banks. Person-to-person transactions will virtually end, except for the possibility of barter, which would be likely to flourish as soon as the public have realized that they’ve been hoodwinked. Unfortunately, our friend Paul Revere is nowhere to be seen on the horizon, but the Federals are indeed coming and the American people, in the not-too-distant future, will need to learn to survive the onslaught from the digital currency system that will take the place of the bullets of the late eighteenth century. Once again, Americans will need to understand, as did their late eighteenth century forebears, that their only hope against a more powerful opponent is to use their wits – to adopt the minuteman approach and implement the economic equivalent of guerilla warfare.